This elegant, three-bedroom Colonial home offers an inventive, open floor plan with well-planned, circular traffic flow. For easy entertaining, the sunroom with ventilating skylights shares its wet bar with the adjoining great room. Spacious and open, the great room is an ideal place to entertain and includes a dramatic fireplace. A contemporary center-island kitchens services the dining and breakfast areas, while both the breakfast bay and sunroom open to a large rear deck. Skylights and a wet bar are just two exciting details in the sunroom. Upstairs the master bedroom is a relaxed retreat. The lovely master bath pampers its homeowners with luxury. A double-bowl vanity, whirlpool tub, separate shower and spacious walk-in closet complete the suite. 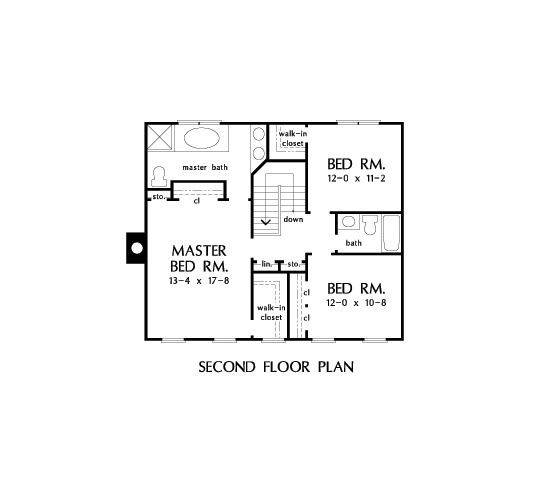 Two secondary bedrooms share a bath and makeup the rest of the second floor. Downstairs, a storage space and utility room lead to the garage, giving homeowners plenty of space to store junk. 1st Floor: 1168 Sq. Ft.
House Dimensions: 62' 6" x 36' 2"
Great Room: 13' 4" x 23' 2"
Master Bedroom: 13' 4" x 17' 8"
Foyer : 6' 8" x 13' 2" x 8' 0"
Dining Room : 12' 0" x 12' 6" x 8' 0"
Great Room : 13' 4" x 23' 2" x 8' 0"
Kitchen : 12' 0" x 14' 8" x 8' 0"
Breakfast Room : 9' 8" x 10' 0" x 8' 0"
Utility Room : 5' 6" x 3' 0" x 8' 0"
Garage : 20' 0" x 20' 8" x 0' 0"
Garage Storage : 5' 6" x 3' 2" x 0' 0"
Master Bedroom : 13' 4" x 17' 8" x 8' 0"
Bedroom #1 : 12' 0" x 10' 8" x 8' 0"
Bedroom #2 : 12' 0" x 11' 2" x 8' 0"
Porch - Front : 5' 0" x 4' 0" x 0' 0"
Deck / Patio : 30' 4" x 9' 4" x 0' 0"
Storage (Other) : 3' 2" x 1' 0" x 8' 0"
Storage (2nd Fl.) : 3' 0" x 1' 0" x 8' 0"
Other : 12' 0" x 9' 0" x 8' 0"